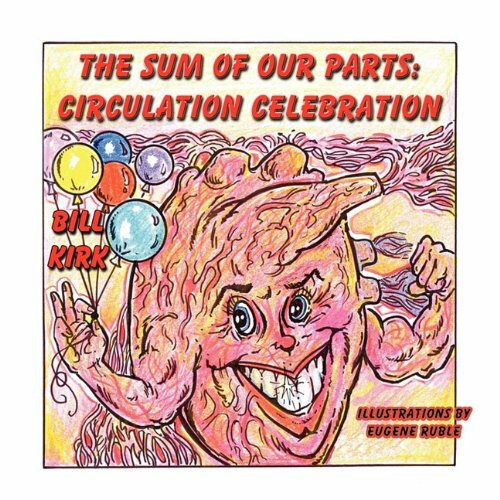 Bill Kirk’s non-fiction children’s book deals with how the heart works by educating youngsters about the human body. Facts are offered on blood volume by age, how often the heart beats, and the job of the vessels, capillaries, arteries and veins—giving in-depth information on all. Delving deeper into the human anatomy, several illustrations depict parts of the heart, giving clear and concise descriptions of the chambers, the auricles and ventricles, how the heart beats and pumps blood throughout the body, and how one can measure their heart rate. Mr. Kirk also describes how and why doctors use stethoscopes. Different blood types are discussed demonstrating how the blood flows through the heart and body, along with information about donating blood, and the purpose and explanation of red blood cells. Interspersed throughout the book are charming illustrations and analogies of the heart and blood. For example, there is the diagram of a human heart pumping iron as one would do at the gym, and another of a bloated mosquito filled with human blood. These drawings not only depict the different functions of the circulatory system, but enhance them with rhyming anecdotes. At the conclusion, Mr. Kirk has offered a list of medical words, descriptions and facts that children can learn and become familiar with, as well as an illustration of the human figure displaying the many different arteries and veins. He has also included a Word Search puzzle that will even entice the adults and or add to a child’s resources and enjoyment. Reviewer Nancy Carty Lepri is the author of children’s chapter book Tiny Angel.